Problem of weed control is a major factor that entails loss in productivity, environmental pollution, reduction in drudgery in agriculture and food production and a major challenging task. Food is basic need of human and concern all rich and poor, developed and developing countries of the world. An innovative practice of eco-zero weeding agriculture was developed on innovative application of nitrogen cycle management. The new concept of eco zero weeding agriculture was proven by field study conducted in crucial region of Bihar where horticulture has high prospects, produced an exemplary yield of of garlic (Alium sativa L) 125 q/ha against fully weeded manually conventional practice 36 q/ha. The resulting land equivalent ratio was over 3.5 and net return enhanced to Rs 374312 (US$6240)/ ha against benefits of Rs103000/ha (US&1585) with weeding. This eco zero weeding is applicable to all crops and ecosystems. The eco-zero weeding also surpasses all known or other upcoming innovative technologies for weed management in agriculture. The exemplary enhancement in yield by this innovative technology proves to be new way of overcoming widespread shortage of fixed natural resources the Earth and control of emission of GHG nitrous oxide. Atmosphere CO2 concentration had already increased from 275 ppm in pre-industrial times to 387ppm which is higher than at any time during the past 20 million years, resulting in global warming . Global warming and fast growing world population intensify the need to develop solution for our food and energy needs [2,3]. Among several challenges, weeding and weed management have ever existed as a universal problem in agriculture. Objective of this research was to develop maneuverable feasible eco- zero weeding agriculture, as a universally applicable, a Sun technology, for overcoming severe problem of weed management and bringing total solution in agriculture is soil erosion, crop biodiversity, enhancement in nitrogen fixation and reduction in land degradation due to loss in soil nutrients. A new concept of maneuverable eco zero weeding was perceived and developed by innovative application of nitrogen cycle supported by knowledge pillared by different sciences viz. plant science soil science, agronomy, hydrology, physics, chemistry, environmental science and environmental engineering [4-9]. In the new technology a favorable ecology is created in field by sowing suitable nitrogen fixing crop in advance or simultaneously at the time of sowing of agricultural crops. Various conceptual scenarios of yield and accumulated enhancement in yield are depicted in Figure 1. It is expected that continuous practice of eco zero weeding, the growth cycle and compositions of weeds will get altered, weakened and naturally eliminated due to vitiation of cycle of reproduction either by seeds or by roots etc. A nitrogen cycle management prudent innovative non-monetary input involving maneuverable eco-zero weeding technology was developed which will prove to be a panacea shrine for total solution in agriculture [4,10,11]. The maneuverable eco-condition is created prior to or simultaneously while sowing any desired crop in rows by seed drill and eco-creating crop by broadcasting. Figure 1: Conceptual diagram of total yield gain due to N cycle managed weeding. Experiments were conducted at experimental farm of Tirhut College of Agriculture, Dholi, North Bihar, India during Rainy season (kharif) and winter season (rabi) 2016-17. The experimental site is endowed with good quality of labor, low land holding entails owners working and taking good care of crop without shortage of laborer’s, need of supplemental nutrition for maintaining good health and livelihood. The college farm is located on the southern bank of river Burhi Gandak command area of north Bihar, India, at 25.980 N latitude, 85.60E longitude and at an altitude of 52.18 m above mean sea level. Eco condition was established by sowing lentil (Lens culinaris), a nitrogen fixing crop after seeding garlic (Alium sativa L) at 15 cm in rows and plant to plant spacing 10 cm in 2016. Treatment details are T1: Fully manually weeded plot; T2: No weeding Control; T3: Eco by seeding lentil @25% of normal seed rate;T4 T3: Eco by seeding lentil @50% of normal seed rate; T5: Eco by seeding lentil @55% of normal seed rate; T6: Eco by seeding lentil @100% of normal seed rate. Other crop management practices were uniform as recommended for garlic yields were recorded. The yield of garlic in no weeding and no nitrogen fixing eco crop was 55.5 q/ha against that from fully weeded plot 35.5 q/ha (Table 1). Thus, no weeding treatment produced 20 q/ha more yields than that with fully weeded plot. On the other hand, weeding involved investment on account of large number of manual weeding man-days at high cost. This situation indicates a fact which otherwise is contrary to common belief that weeding will overcome crop loss, in general. Against this, nitrogen fixing eco crop based zero weeding produced optimized exemplary yield of 125 q/ha. Since garlic is shallow rooted crop, weeding involves tilling of surface layer that causes drying of shallow root zone of garlic, hence producing stress for the crop. In the no weeding case there is nitrogen fixation even with weeds that support crop on one hand and no disturbance to cause moisture loss from shallow root zone. This mechanism is more effective in experimental site with light loamy and sandy loam soil at Dholi, Samastipur, Bihar. Note:*The maximized yield level at xero weeding treatments. The different methods of weed management and their effect on yield are shown in Table 1. The existing practice of weeding, by manual weeding in garlic, involve high cost, thereby will reduce B/C ratio for the cultivators. Treating this as a control, land equivalent ratio (LER) will be 1 and in contrast to this zero weeding agriculture produced the LER 3.2 and 3.5 (Table 1). Thus, with eco-agriculture practice developed in the present study reveals tremendous prospects for enhancing yield of garlic, a close growing crop, for which no innovative practice could be devised. This fact reveals that the technology of eco-zero weeding agriculture is robust and effective in wide range with tolerance for completion by nitrogen fixing crops. It is found that lentil sown at 51% of normal seed rate of sole crop of lentil produced maximum yield 110 q/ha. With slight improvement in yield of this study at per trend established in other parallel experiment, the yield of garlic reaches to 125 q/ha, which is an exemplary yield level . Further possible improvement showed still higher yield level than recorded in the field experiment at Dholi, Bihar. A summary of weed management practices and resulting yield are presented in Figure 2. Eco-zero weeding agriculture has shown enormous yield increase. Experimental data revealed that even no weeding increased yield. Similar effect on increase in yields was found by another study when nitrogen fixing crop was sown as band . In the densely planted garlic crop the presence of weeds increased yield instead of depletion, because of drying of surface soil in weeding induced disturbance of soil layer. It also fortified that weeding is proving ineffective and costly. This innovative technology surpasses all innovations being developed to meet challenge of weed management in world agriculture viz. weeding by robot, smart agriculture and specialized weeding machines. Adverse weather conditions make these provoked innovative technologies of weed control, other than eco-zero weeding, will remain un applicable and ineffective. Therefore, in spite of all innovations the challenge of weed management cannot be met with and the weed control will remain as distant dream. In this situation eco –zero weeding agriculture proves to be the best technology, as it continues to work under all adverse condition of weather creating non conducive condition for field work. Further, it is nonmonetary input practice and is applicable for all crops and ecosystems, with the fore mentioned example cases it is sufficiently substantiated that pulse based eco zero weeding agriculture produces multiple benefits of increase in LER, increased benefit cost ratio (B/C) (Table 1), weed control and biological nitrogen fixation. The yield increase with sustainability and quantity enhancement are substantiated. Thus, new toil free eco-zero weeding agriculture shows the present and future yield potential with the technology presented in the study. The potential yields will get easily achieved by combining again a supplementing technology of racy nature agriculture [13,14]. If suitable moisture building mechanism is created, still higher high yields than achieved can be harvested. An irrigation practice termed as ultimate green irrigation practice for this purpose was developed which will be highly suitable for shallow rooted crops such as garlic and onion . 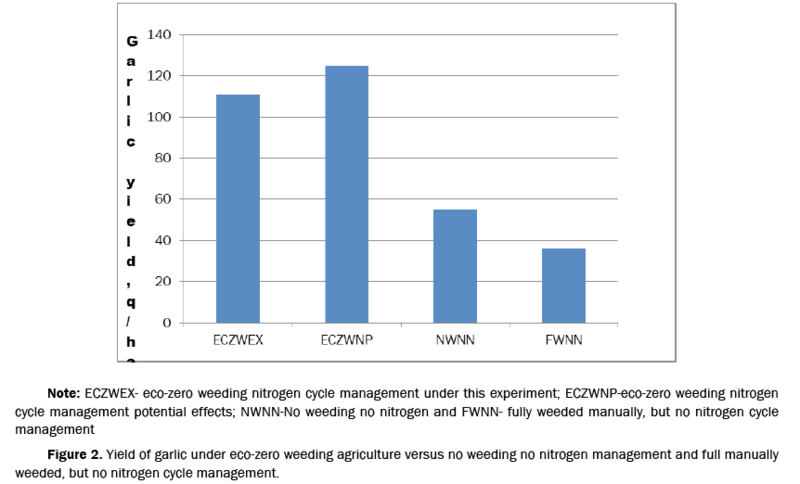 Figure 2: Yield of garlic under eco-zero weeding agriculture versus no weeding no nitrogen management and full manually weeded, but no nitrogen cycle management. An important aspect has emerged from this study is that all blames had been levied on anthropological source ie agriculture as the main contributor of GHG Nitrous oxide. This study revealed that among weeds there exist weed species which emit GHG Nitrous oxide and contribute to the global warming. This new eco-zero weeding will suppress GHG Nitrous oxide, hence, the nonarable lands also be brought under species that reduce emission of GHG Nitrous oxide by reducing reserve of nitrogen in soil under weeds. This eco zero weeding can be exercised to bring complete reduction of GHG Nitrous oxide by sowing some nitrogen fixing crops, that will help weeds use soil reserved nitrogen and reduce emission of GHG N2O from non-arable spaces. For shifting from the existing practices, whatever, they might be one in usage to this eco- zero weeding practice, it does not need any extra external inputs of additional budget, man power and machine. The eco-zero weeding agriculture saves drudgery for the agricultural workers. This innovative zero weeding agriculture technology is very relevant, effective, efficient, impact creating and sustainable (REEIS). Thus, while accomplishing the challenge of weed management by eco zero weeding agriculture, sufficiently established by this experimental results, other benefits of zero weeding agriculture viz. reduction of erosion and reduction of land degradation due to nutrient discrepancy, increase in drought endurance, potential for insect and pest control etc. will automatically taken up by the researchers inspired by this innovative research, in time to come. The eco zero weeding additionally helps overcome earth overshoot. The experiment showed contrasting results in response to eco established in the study. Unweeded treatment showed yield more than that with fully weeded treatments that implicates that weeds also fix nitrogen that enhances yield of densely cultivated crop, which is contrary to common belief that weeds always create loss in yield of crops. All eco treatments enhanced yields at all levels albeit at varying levels. Optimization analysis revealed maximum analysis which otherwise is not possible to establish by random levels of doses of field treatments. Thus, this study resulted in good way of establishing most suitable and appropriate eco for zero weeding agriculture. This study established most important aspect of weed control by eco-zero weeding. Thus, it opens new innovative and feasible eco leading to treatment measure for weed control in agriculture to replace pollution causing measures such as weedicides and costly measure of manual and mechanical measures for weed control. Once yield enhancement is established and substantiated, other benefits are certain to occur in the eco-established zero weeding agriculture. For control of emission of GHG N2O from non-arable lands, be area not under crops, viz. fields bunds, grasslands, pastures, orchards, forests, lawns and gardens, also be brought to reduce emission of GHG N2O by sowing some leguminous seeds by simple broad casting. The legumes so established will enhance use of soil reserve nitrogen in soil; thereby emission of N2O will get reduced. Food is accepted factor for keeping sound, body and mental health, wher horticulture is a good source of nutrition. The enhancement in yield by eco-zero weeding agriculture, enhances yield to upgrade nutrition and livelihood when the wide spread problem of per capita land is decreasing. The technology will help overcome earth overshoot. The fore going results in manifold enhancement of yield of garlic by the innovative technology culminating in eco zero weeding agriculture have sufficiently substantiated to be highly effective and working beyond doubt. These results further support appropriateness of eco-zero weeding agriculture in terms of relevance, effects, efficiency, impact and sustainability (REEIS) in agriculture. Solomon S, et al. Contribution of Working Group I to the Fourth Assessment Report of the Intergovernmental Panel on Climate Change. Cambridge University Press, New York, USA. 2007:1-996. Lal R, et al. Challenges and opportunities in soil organic matter research. Eur J Soil Sci. 2009;60:158-169. Hutchinson GL, et al. Improved soil cover method for field measurement of nitrous oxide fluxes. Soil Sci Soc Am J. 1981;45:311-316. Yadav RC, et al. Innovative application of scientific facts for arresting GHG-N2O and improvising lucrative ventures with enhanced land, water and nutrient use efficiency. J Energy Environ Sci. 2014;128:486-520. Wuebbles DJ, et al. Nitrous oxide: No laughing matter. Science. 2009;326:56-57. Yadav RC, et al. New ecology for eradicating GHG- nitrous oxide (N2O). Int J Ecosys. 2015;1:1-2. Ehlers W, et al. Water dynamics in plant production. CABI Publication, Walling Ford, UK. 2003. Gustafson AF, et al. Handbook of fertilizers - their sources, make-up, effects, and use. 3rd edn. Orange Judd Publishing Company, USA. 2010. De AK, et al. Environmental chemistry. 7th edn. New Age international Publication, New Delhi. 2010:7-13. Cornwell DA, et al. Introduction to environmental engineering. McGraw Hill Book Series Inc., USA. 1997:33-36. Yadav RC, et al. Innovative application of scientific facts for nutrient recovery from waste water streams for sustainable agriculture and protection of environment: A review. Hydro: Curr Res. 2012;3:1-11. Yadav RC, et al. Racy nature agriculture versus other like technologies: A technologies contrast. Am Eur J Agric Environ Sci. 2013;13:1412-1439. Yadav RC, et al. Racy Nature-A sun technology towards quantum agriculture. World J Agric Res. 2014;2:223-227. Yadav RC, et al. Biotechnology of intra-row banding of cyno-bacteria leguminous crops for raising yield plateau of cereals and oilseeds. Int J Agron Plant Prod. 2013;4:3330-3336. Yadav RC, et al. The ultimate green irrigation practice by innovative application of scientific facts. World J Agron Food Sci Technol. 2015;2:1-30.